The 498 is a really useful route for getting to and from Essex using Transport for London's tariff and not paying a premium for crossing the Greater London border on a train. It runs every 20 minutes Mon-Sat daytimes and half-hourly evenings and Sundays as part of TfL's London Bus Network. You can no longer pay by cash on London's buses. Payment is by Oyster card or contactless debit/credit card only. A flat fare of £1.50 applies for a single journey and you'll never pay more than £4.50 in a day, no matter how many journeys you make on TfL's bus and tram network. Bus journeys are also covered by TfL fare caps for tube and rail journeys. Click here to discover other bus routes across Greater London and the East. Romford developed as a market town in Essex, but has long since been devoured by London. There's plenty to do in Romford including watching dog racing and what feels like umpteen markets and shopping centres. The 498 starts from Queens Hospital before running through the town centre. At Romford Station, the 498 towards Brentwood goes from stop V.
At this junction at which people were regularly executed in public in the 16th and 17th centuries, you can now go shopping for furniture. 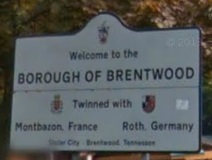 Just outside Greater London, Brentwood welcomes you to Essex. There's plenty to see and do here. There's Hopefield Animal Sanctuary, just a short walk from the 498's final stop at Sainsbury's. Or for a history lesson, try Kelvedon Hatch Secret Nuclear Bunker, which can be reached from Brentwood High Street on the Ensign 21 bus towards Ongar. It's also the home of ITV2's tediously tacky The Only Way Is Essex. You can even go on a TOWIE tour, if you absolutely must. Here below is the route of the 498 in Brentwood. 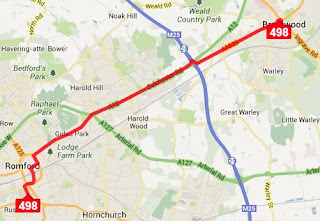 See a map of all bus routes in Brentwood here and all routes in Essex here, courtesy of Essex County Council. See a live map of bus locations here. If you're travelling from Essex, the Essex Saver at £8.00 (Mon-Sats) is valid, but can't be purchased, on the 498 all the way into Romford. 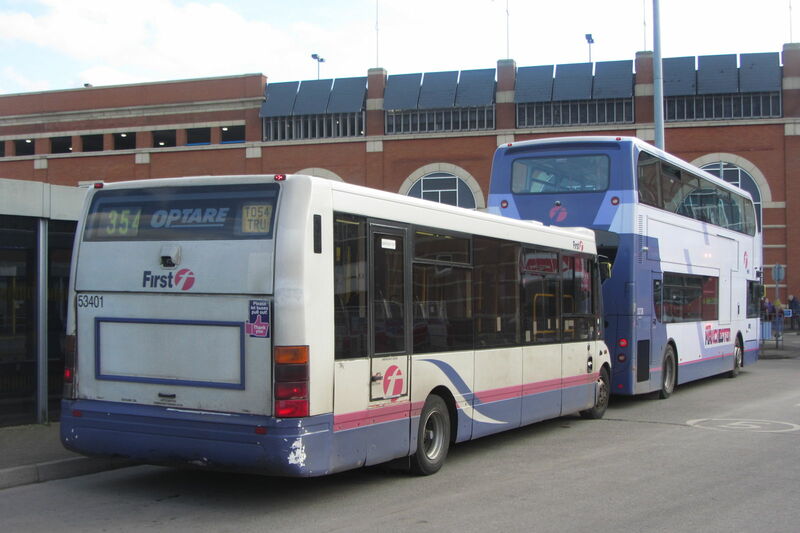 It is valid on almost all bus services in Essex plus those, like the 498, that leave the county, as long as your journey either starts or finishes in Essex.